No word official word on when CameraMouse will be available for free download, but it should be any day now! I have blogged about Sclera Pictograms before. Sclera is a Dutch organization that has created over a thousand high contrast, black and white picture symbols. They offer the images free on their website. I have found the images to be very affective with my students who have low vision, in addition to some of my other students who benefit from a more "grown" up selection of symbols. In fact the two tactile books below and my Household Noises activity use Sclera Images. Although I still prefer Mayer-Johnson PCS most of the time, primarily because my students have been using them for so long, Sclera is a nice alternative for when I don't have Boardmaker handy and is somewhat better than PCS for my low vision students. To download the entire English set go to this page and scroll about 3/4 of the way down. 2. Go to File, Import, then Picture. 3. Locate picture wanted (it must be in one of the following file formats - .wmf, .emf, or .bmp). 4. Graphic appears in dialog box. Name and categorize symbol. If I missed any please comment and add it. Also, if you want to share your Boardmaker Files you can do so at TLWMSN Google Group. Need a pick me up? Don't tell me you don't not when you are reading a special education blog in the summer, during vacation. Check this out: In Honor of Educators. Get a box of tissues before you watch this. 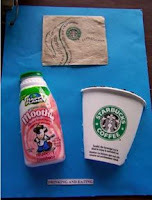 I have created some tactile books in Power Point. They are below in Slideshare format and can be downloaded and printed. I recommend printing them in portrait layout instead of landscape, if you can, so you have more room for the tactile/object symbol. 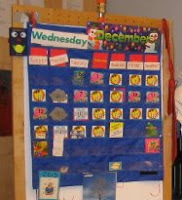 All you need to do is laminate or put into page protectors, attach object/tactile symbols and bind. 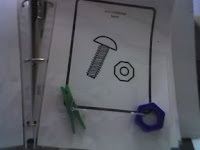 After the success of my student's tactile schedule book at the end of the school year I am thinking of making a few more tactile books for him over the summer. I have found a few websites to help me along in my mission and I thought I would share. Tactile Graphics offers design guidelines and production tips for two different types of tactile graphics: collage and capsule paper. 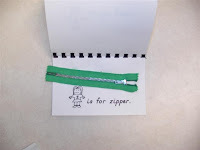 Mrs. Meacham's Classroom Snapshot Page has a lesson plan for creating Tactile ABC Books which can easily used as instructions for teachers such as myself to create similar books. BC Deafblind Web has a great article on what they call experience or concept books (aka tactile books). 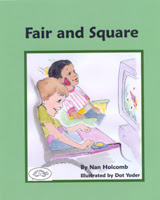 They include page by page samples of seven books with digital photos and explanations. I really like what they have done and can't wait to try out their ideas. NCTD in the UK has elaborate information on making tactile books, including a few PDF guides. I learned a lot from their book "Telling Stories Through Touch." The American Federation of the Blind also has a few ideas. As soon as I make my first tactile books I will post it. If you have some time this weekend, or anytime this summer you might want to start exploring some of the great free online resources available as part of the Web 2.0 revolution. Many of these are part of Google or interface beautifully with various Google applications. I have about 100 Gmail referrals is you want one to make your Google collection complete. Just e-mail or comment. *I personally use this one. Today Physorg had an article about Hitachi introducing a device that read brainwaves to preform as a switch. Activity in the frontal cortex, such as doing mental math, activated the switch. The device uses optical topography meaning it uses infrared light to monitor blood flow in the brain. Hitachi realizes the two pound cap isn't the best design for users. Of course similarly functioning products have been around in A.T. for a few years. 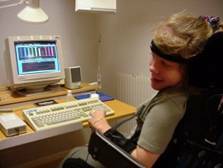 Cyberlink's Brain Fingers uses biofeedback to allow people with severe or multiple disabilities to access computers and AAC. Brainfingers has the advantage of taking multiple data allowing many different electrical impulses from the face, head, eyes and brain to control the application. The MCTOS switch (Mind Controlled Operating System) uses biosignals from the brain, through a device worn on the forehead, to activate the switch. It is compatible with all toys and devices that can be used with a regular 1/8 adaptive switch. There is a MCTOS page for more info. Here are some links summer school teachers and camp counselors at programs for youth with multiple disabilities might find helpful. They think I’m weird, strange. When I came to it was there. But forced to swim in the sea. To be like this though? Stacey Ahern is entering her senior year at Sarah Lawrence College in Bronxville, NY. She is a member of SLC's disability action group, Beyond Compliance. This poem is printed in their zine. She is a writer and an activist, who lives with brain injury. She is also my little sister and I am so proud of her. AAC Institute has available for download assessment software for use with students who are learning to access a single switch. The software assesses and keeps data on latency of switch press from visual/auditory cue, latency of switch release from a visual auditory cue and ability to press switch repetitively. The cue is a large, full-screen if you wish, rectangle with text and a sound effect (no voice cue, just a sound). You can set the colors as you wish. The software also allows for you to record the name of the student, the switch site and type and any notes. I can see this software being beneficial for statewide alternate assessment, IEP related data collection and figuring out where to set the baseline timing for switch users on new AAC or alternative access devices. The Welsh Education Bureau has several free online switch activities available. They are all for early learners and use the concept of a coloring book. Two are free coloring and two require the student to find the correct color. You can set the scan time as needed and switch should be set to space bar. As many of you know the success of this blog has been astonishing to me. I meant it as a way to kill some time after an ankle surgery seven months ago, but it took off into something else entirely. TLWMSN has had some mentions on Technorati in various catagories. The blog has been added to StumbleUpon under the catagory of disabilities. We are a prime source of "clicks" for several videos on YouTube. 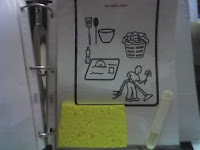 Also, the blog is quoted on Dynavox press materials. Not to mention that my custom joystick layout is now included in the download pack of onscreen keyboards from Click N' Type from Lake Technologies! And there are eight slide shows on Slideshare, the TLWMSN Website and TLWMSN Google Group! you have been heard to say things like, "So and so, please take your head out of the play oven, it is time for circle" or "No, you are not Batman" or "For heaven's sake, So and so, press your switch so I don't have to hear that computer say 'Make something happen!'" or "You are right, So and so, touching girls is a bad idea." You know what IEP, FAPE, ABA, APE, AT, AAC, LEA, OT, PT , O&M, ADD, ADHA, OCD, CP, MD, ED, BD, EDBD, BIP, IDEA, TASH, ARC, CEC, LEP, ELL, NCLB, TBI, and LRE stand for (or used to stand for). You use words and phrases that other people don't know like "stimming" and "transition cue"
You find yourself using kid idioms like, "Awesome! ", "Excellent" and, my favorite, "Awecellent!" People actually ask you to tell stories about your job at parties. However, some of your stories about your job are only funny to others in the field. With just three more days in the school year I am looking forward to a few weeks off before summer school starts and then a few more after summer school and before the new school year in September. Today, as I was driving along after visiting a couple of new students who will be coming to our summer school, I started thinking about those learners I served in the first half of my now-entering-year-eleven career. I wish I had known then what I know now so I could have served those students better. Those early-on students had the benefit of my passion, which is now tempered with experience. As far as technical, educational knowledge I wish I had known more about vision impairment and blindness. I wish I had known more about typical and atypical speech and language development. I also wish I had known more about working with families and how to stand up for myself as a young, fresh-out-of-college teacher. 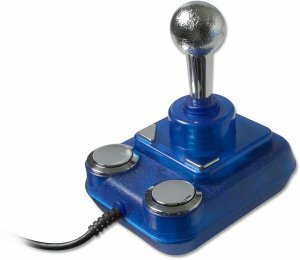 Once I had begun using the free Joy To Key software with the Kidstation Controller and a Logitech Joystick, I began looking around for a joystick that would be easier for my students to use. The Logitech Attack is too big, with too many buttons and hard for users with grasp difficulties to activate. Finally I stumbled upon the Retro Competition Pro USB. The dimensions were close to what most of the power chair users have for joystick in my classroom so I went looking for one to purchase. Both American vendors were sold out (C64reloaded and Software Hut) and the UK companies were not as good a deal on shipping as I could get from UK sellers on Ebay, so I bought it on Ebay. It arrived today. Of the two colors available, red and black or blue and silver, I choose the blue one. It has four buttons, two of them being large and easy to access. Their is a built in switch to turn off the buttons if you don't need/want them (I plan to have them off and use a head switch for clicking or a dwell program with my students). Upon plugging in the USB to my computer it was immediately recognized without any need to download any drivers or anything. Programming Joy To Key to work with it took under five minutes. Since there are only four days left in the school year you will have to wait until September to hear how it goes. This is an iPod speaker that was on clearance the week after Easter for $2.50. Besides being adorable and playing music, it has three vinyl picture frames which act as symbol holders for some situation based AAC. The symbols are "more", "done" and "volume". This is one of my students wheelchair tray. Obviously it serves another purpose, communication. The board was made with Boardmaker and is attached to the underside of the tray with contact paper. These are our classroom rules, written by the students and illustrated with Mayer-Johnson Picture Communication Symbols. A few days ago I wrote about how I made a tactile/texture schedule board. Well, in preparation for sending my student to summer school, where he will have a different teacher, I transfered the board to a book. Our summer school is outdoors and more like a camp. If the materials my students are using aren't clear and understandable to the summer staff they don't get used. However, things frequently get dirty, nearly destroyed or totally annihilated at summer school, so you don't want to send anything priceless or that cannot be remade. I wanted to make the tactile schedule easier to use as learning or looking up the meaning for every tactile symbol and then arranging them daily on a Go! Board is not the type of thing that works well at our summer school. I also wanted a more portable system. Using Boardmaker, I printed full page black and white PCS symbols on white heavy card stock, and slipped them into heavy duty pocket protectors. 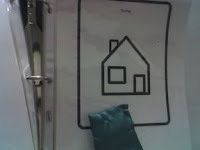 I attached the correlating tactile/texture symbol to each page using plastic ties or hot glue (depending on the object). I made sure the tactile symbols were really well attached by yanking on them full force and even dangling the binder by the various attached symbols. All of the schedule pages were then put into a big white binder with those see through covers. In the clear cover on the back I typed out instruction for use and the front cover I adapted to be tactile, so the student can distinguish his binder from others. To my delight, after just four days using the binder instead of the old tactile schedule the student is able to flip through it and, using touch only, find the page that represents what is next in the day. In fact, today he sat down in his seat and the paraprofessional showed him (hand over hand) that the book was open to bathroom, which was next on his schedule. He reached out and flipped through the pages, finding the tactile symbol for life skills group and opening the binder to that instead. What was interesting about him doing that was he only has life skills group on Thursdays, and has only been in the group for a couple of months, so it was surprising that he was right. He has had a continuously difficult time adjusting to Thursdays being different because of life skills group. 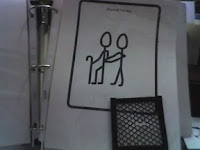 Today he showed us the symbol for life skills group first thing in the morning, on the right day, and then, for the first time, made it through the group without a problem. 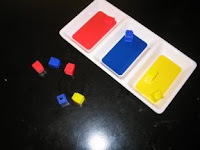 A little creative thought and Click-N-Type can be used with learners with cognitive challenges. You could make a board using the Click-N-Type designer that just has the letters of a students name or you could make a board with just numbers for a student to enter answers to math questions or use an onscreen, but not accessible, calculator. You could even make a board of all macros for higher functioning students to use to enter certain strings of text while they are using a regular keyboard. I am sure there are dozens of other ideas as well. Click-N-Type is a remarkable piece of software and is well worth spending some time getting to know. It is hard to believe it is free, especially when you compare it to other, similar programs (which can cost from to $350 dollars to $500 dollars). Sorry,packing my classroom and paperwork left no time for blogging today. Maybe tomorrow. I want to say sorry in advance to any lack of posts, or lower quality posts in the next several weeks. Our last day of school is June 15th and we need to have our entire classroom packed and ready to be moved to a storage unit by then. I have been going in at 5:30 in the morning and staying until 7 or 8 at night in order to do some of the cleaning and sorting that makes packing possible. 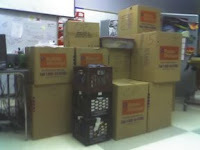 This was the pile of boxes at six o'clock tonight; I added three more before I left at seven. Behind that wall of boxes is my desk. I keep telling the kids I am building a fort. Since I knew I would have little energy for a researched post tonight I took a few pictures of some DIY math activities as I packed them. These are our unifix plates. 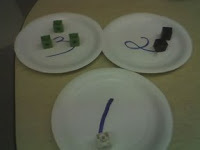 On each plate, 1-10, there is a numeral written and that number unifix blocks hot glued on. The students have to make a matching plate (the numerals are already written, they just have to count the correct number of blocks). This is our coin sorting tray (ignore the shiny tape across, that was to keep the bins from falling out in the packing box). The tray supposed to be for condiments to be served at a picnic or barbecue. I think I bought it a year ago at a discount store for a dollar. We keep a big jar of change in the room and periodically one of the students is assigned to sort out the coins so we can roll them, or use them at the laundromat or vending machines. Here is a similar tray, also about a dollar from some discount store. We use it for sorting by color. 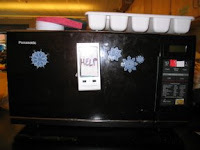 Here is our microwave. Velcroed to the front of it is a talking picture frame from the clearance bin at an electronics store. In it is a paper that says, simply, "HELP". The recording says, "I could use some help over here." 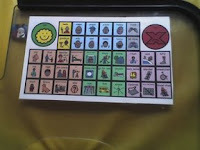 The red button is the minute button and the white is the seconds button, they are adapted for low vision and at the bottom right is the start button adapted with a sun sticker. On top is the silverware sorting tray show below. 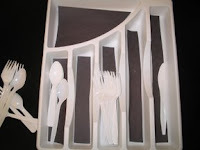 Here is our silverware sorting tray. We obviously use plasticware, not silverware. We reuse it forever (or until it breaks, discolors badly or melts), so don't worry about our environmental impact. 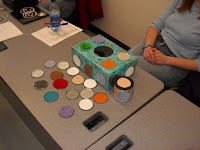 The black paper is cut out and put into the tray to increase the contrast for the students with visual impairment. That is all the pictures I took today, so here is one cropped out of an old photo. This is our calendar. We use weather symbol numbers so that at the end of the month we can graph the weather. You can see a Joke Master Jr. to the left for the Joke of the Day. On the first school day of each month I go through the holiday cards one by one and the students tell me if they happen in the new month, if they do we put them up in their spot. To the left is a tie for the news reporter for the day to wear. At the bottom is a cold symbol so that we can talk about the temperature in addition to the weather and there is a picture of a tree in winter to show the season. Finally, a bonus picture. Why the focus on sorting? Because it is a vocational skill that students will use. 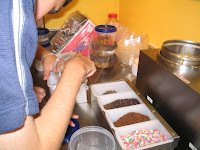 This is one of our students working at Ben and Jerry's, dispensing the toppings into a containers for the scoopers to use. 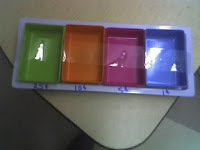 If the student did not already understand sorting the toppings could all end up in the same containers. 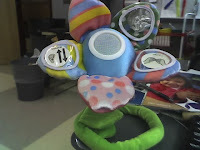 As I said yesterday I plan to continue working with my students using CameraMouse tomorrow. I have come up with a short list of age appropriate sites we will uses to work on moving the mouse and targeting the pointer. These sites would also be appropriate for teaching mouse skills with any other kind of mouse emulator or for use with a touchscreen. Yesterday I introduced two of my students to CameraMouse. Actually since CameraMouse will not be ready for trial for a month (see previous blog entry) I introduced them to Qualieye's free 30-day trial. Qualieye is similar enough to CameraMouse that when CameraMouse does come out for free in July I can switch them to that. I also installed some extra large cursors to make things easier for the students. Extra large cursors are available from a number of places including the ACE Centre. Both students have degenerative neuromuscular diseases and little voluntary muscle control. The first student, an art lover, controlled the CameraMouse with her fist. To her delight (and mine) the camera focused in on the ring she received as a gift from a boy who likes her and it was the light reflecting off the ring that moved the mouse. This student used the CameraMouse, set to auto-click, with the free online Jackson Pollock painting program to create some beautiful art. She loved every minute of it. Immediately after painting with CameraMouse the speech therapist saw her for a session and the student clicked through several layers on her Dynavox to go to the art page and ask the SLP to paint again. During her speech session the student used her Dynavox to dictate a note to me asking if she could do more painting. I, of course, let her. My other student used her head to control the CameraMouse. It took us lots of playing with the settings to make it work for her. Using the Jackson Pollock program she enjoyed keeping the mouse still to change the color (usually to pink) and then painting a little before she changed the color again. She understood quickly how the auto-click worked and that staying still was the key to selection. A while later I tried her on the Little Fingers Balloon Game. Although this game is well below her cognitive and age level, she found it to be quite entertaining as she worked on controlling the CameraMouse enough to stay still over the small balloon that showed the letter she was looking for. After she popped four balloons, she turned to me, glowing with pride and said, "I am getting good at this!" For a young lady who has only ever lost ability because of her disease the joy in gaining an ability was obvious and heart warming. Monday these students and I will spend some more time with CameraMouse. I am working on finding some fun and age appropriate games that are simple enough for beginners using CameraMouse. I plan to try some of the Reactive Colors activities. After that much pride and accomplishment the day ended with our school prom, which is always thrilling. Days like this remind me why I choose this career. Today saw the 5000th visit to my blog since its inception in November of last year. Ironically the visit was from someone at Simmons College, my alma mater ('98 and '99 M.S.Ed. ), without Simmons this blog would not exist. Thank you all for visiting!